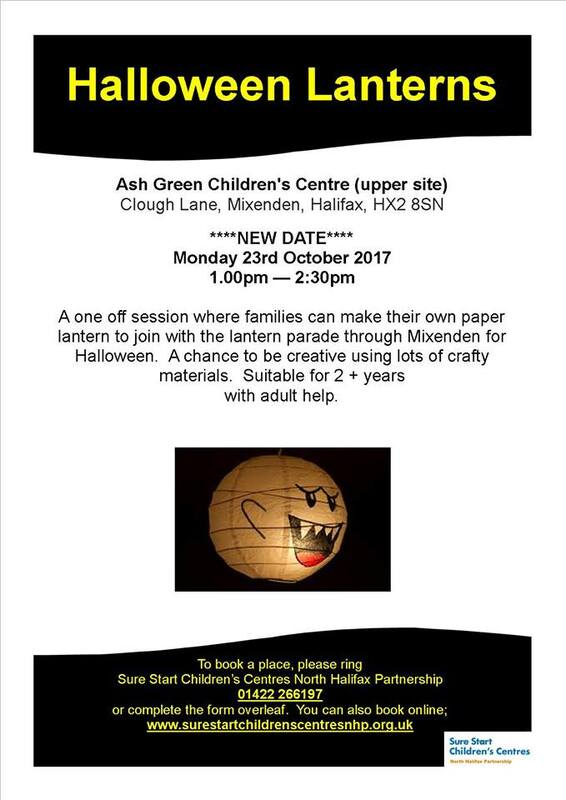 Ash Green Children’s Centre have a new date for the Halloween Lantern session. It will now take place on Monday 23 October at Ash Green Children’s Centre, Mixenden, HX2 8SN from 1pm – 2:30pm. The date was moved to allow everyone to join in with the lantern parade which is organised by Ash Green Community Primary School around Mixenden on Thursday 26 October. There are still some places available if you would like have a go at making your own Halloween lantern, even if you save it for trick or treating. This is a free event for families with children of all ages but to make the most of the session the activity is aimed at children 2 1/2 years upwards. Booking is essential. To book your place give the family learning team a call on 01422 266197 or book online through the website.